This lesson is intended to provide a description of how to document additional considerations, determine provision of services (i.e. Resident District or Operating District), document how parents were informed of the IEP, and provide additional resources to help parents understand their rights. This lesson also requires that you have added an invitation, indicated parental/participant attendance, indicated that the student is not eligible for special education services, and provided rationale for an ineligibility determination. For more information on how to add an invitation and participant information see the, "Create an IEP Invitation" chapter in this manual. For more information on how to input parental/participant attendance, determine eligibility, and provide rationale for an ineligibility determination see the, "Complete an Ineligible IEP" chapter in this manual. 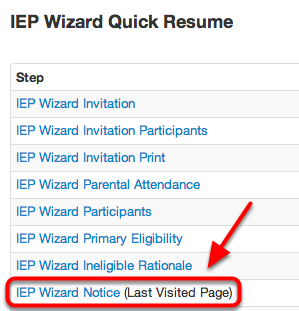 From the IEP Wizard Quick Resume Menu, select IEP Wizard Notice. 1. Describe the option or other factor considered in the field to the left, provide rationale for not incorporating the option or other factor in the field to the right, and click the Green Plus Icon to add the description and rationale. Note: You MUST enter at least one option or other factor that was considered but not implemented or you will not be permitted to move on. 2. Select the site in which the programs/services will be provided. 3. Input a staff member who can assist parents in understanding their rights (begin typing the person's name and click on his/her name to make the selection) and type in a phone number where he/she can be reached. 4. 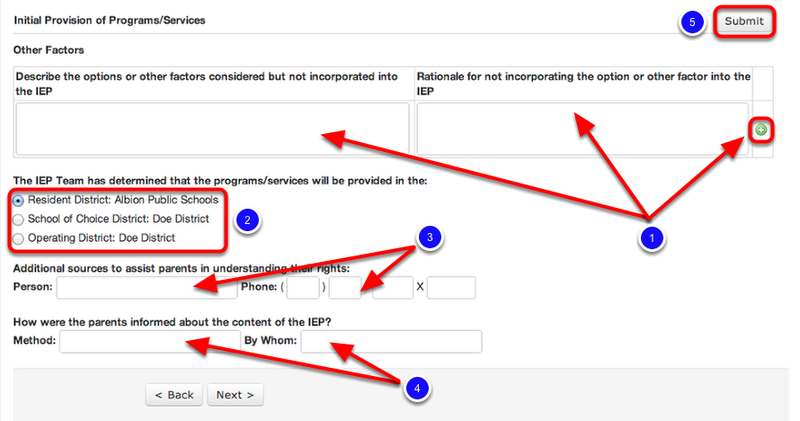 Input the method by which parents were informed about the content of the IEP and select the staff person who made the contact (begin typing the person's name and click on his/her name to make the selection). Choose whether the resident district or the operating district will conduct subsequent IEP Team meetings. You are now ready to publish the IEP. For more information on how to publish an Ineligible IEP see the, "Publish an Ineligible IEP" lesson in this manual.